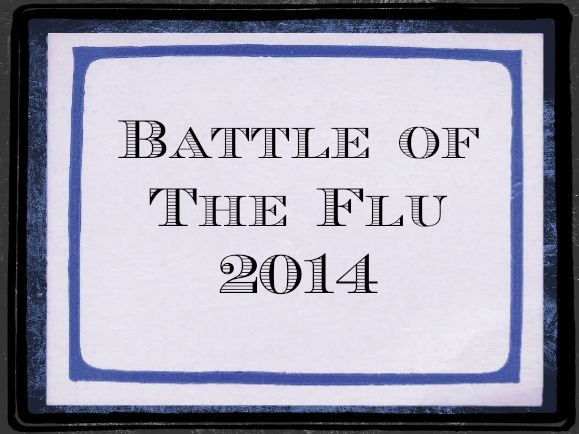 Have You Battled the Flu? What’s your excuse for waiting to get the flu vaccine? Mine was that I couldn’t find the time to make an appointment to see my doctor or to wait in line at the pharmacy or Target. (And I also have a serious needle phobia.) But when the flu started going around the community center where my son goes to preschool, I certainly made the time and got my shot the next day. According to the CDC, it’s still not too late to get the vaccine; the flu virus is now found in 41 states and the CDC expects several more weeks of flu activity. People who are at high-risk for flu complications, such as older adults, children under five, pregnancy women, and people with preexisting health conditions, are strongly encouraged by the CDC to get the vaccine. For most people, the flu is a common winter misery, but it’s important to be educated about the vaccine, symptoms, and treatment because it can also be a dangerous illness that leads to serious complications. As for us, I’m hoping that we’ll continue to be a flu-free household this winter. Has your family had the flu this winter? How did you cope? I never used to get a flu-shot because I never got sick. Then a few years back I got the flu. The biggest day of the year for me at work is Dec. 31st and there are parts of my job no one else can do. I went in sick came home went straight to bed and didn’t get up for 36 hours. My husband is now the worst flu-shot nag. He doesn’t let up until I’ve gotten my shot. Fortunately I haven’t been sick since that terrible flu. Not even a cold. BTW – most of the work I did while sick was done wrong and it took me weeks to straighten it all out. We have never gotten the flu shot. I can always find an excuse not to keep a date with a needle. However, we also don’t have any high risk people in our house either…I think if we did, we’d get the shot. But we have been pretty lucky here…none of us ever seem to get very sick. Knock on wood!